Scroll down below the infographic to read more about each event. When: 12 p.m. – 2 a.m.
Where: Spider House Cafe, 2908 Fruth St.
Where: Swan Dive, 615 Red River St. When: 3 p.m. – 12 a.m.
Where: Barracuda Club, 611 E. Seventh St.
Where: Hotel Vegas, 1500 E. Sixth St. When: 1:30 p.m. – 7 p.m.
Where: Midway Food Park, 1905 S.
When: 11:30 a.m. – 7 p.m.
Where: The Spotify House, 1501 E. Sixth St. When: 5 p.m. – 1 a.m.
Where: Nomad Bar, 1213 Corona Dr.
Where: Strange Brew, 5326 Manchaca Rd. When: 6 a.m. – 10 a.m.
Where: W Austin, 200 Lavaca St. This showcase will host other artists Thursday through Saturday, such as Hayes Carll, Soul Asylum and White Denim, and the first 300 guests will be given a complimentary breakfast treat. When: 12 p.m. – 7 p.m.
Where: The Historic Scoot Inn, 1308 E. Fourth St. Titled after the 2014 gender wage gap in the United States, this show will feature exclusively female artists, with a guest appearance from Texas state senator Wendy Davis. Where: The Four Seasons Hotel, 98 San Jacinto Blvd. When: 12 p.m. – 6 p.m.
Where: Barracuda, 611 E. Sixth St. The first part of a two-day series, Pitchfork will host Neon Indian, DAWN, Chairlift, Kvein Morby and more on Friday. 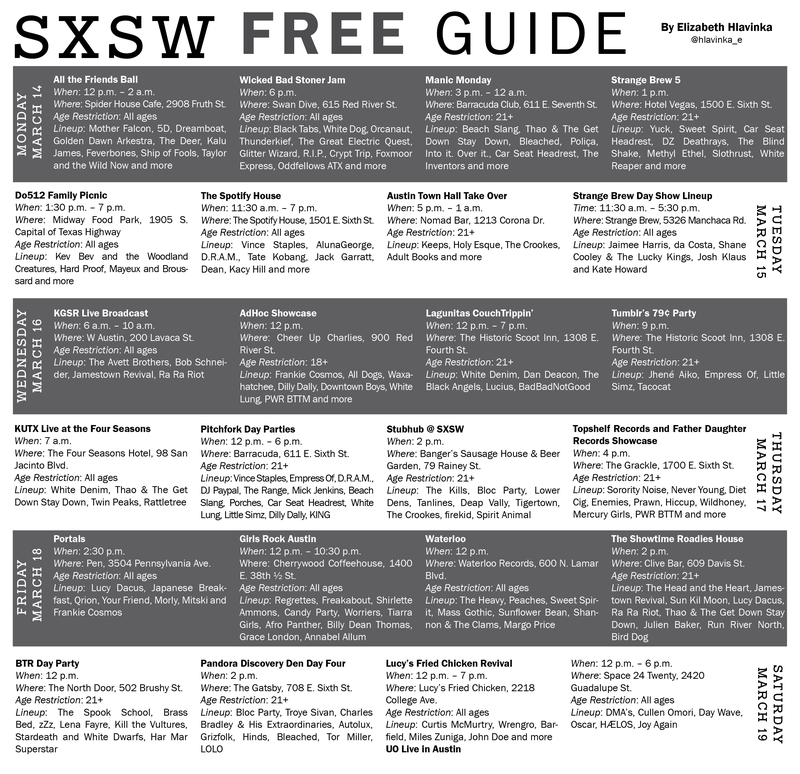 Where: Banger’s Sausage House & Beer Garden, 79 Rainey St.
Stubhub will be hosting daily free events from Tuesday through Sunday with performances from artists such as Miike Snow, Ghostland Observatory and Small Black. Where: The Grackle, 1700 E. Sixth St.
Where: Pen, 3504 Pennsylvania Ave. When: 12 p.m. – 10:30 p.m.
Where: Cherrywood Coffeehouse, 1400 E. 38th ½ St.
Where: Waterloo Records, 600 N. Lamar Blvd. Waterloo will be hosting a series of similar showcases from Wednesday to Saturday, all beginning at 12 p.m.
Where: Clive Bar, 609 Davis St. The last of a three-day showcase, Culture Collide and Showtime present other artists, such as White Denim, BØRNS and Hey Marseilles on Wednesday and Thursday. Where: The North Door, 502 Brushy St.
Where: The Gatsby, 708 E. Sixth St. This rock showcase is the last day of Pandora’s four-day series, featuring dance, Americana and hip-hop/R&B showcases Wednesday through Friday. Where: Lucy’s Fried Chicken, 2218 College Ave.
Where: Space 24 Twenty, 2420 Guadalupe St. This is the last of a four-day series of shows hosted by UO Live, featuring bands such as Car Seat Headrest, Kevin Morby and Guerilla Toss.